Lenovo’s Yoga line of tablets are known for its built-in kickstands and humongous batteries housed in a quirky, yet functional cylindrical base. Three new Yoga tablets were announced today, and all of them run Android 5.1. 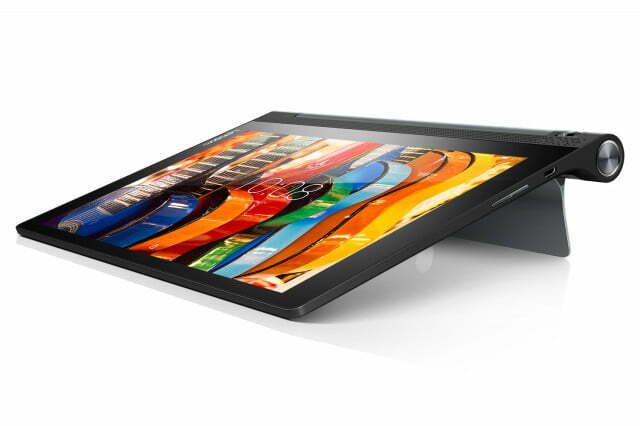 These kickstands allow you to use the tablet in a variety of configurations. The upright position is great for viewing videos, and the tilt option offers a more comfortable typing position. It can also hang from any wall for presentations. The cylindrical base provides more comfort when holding the device in portrait mode, but it’s also where the battery resides. 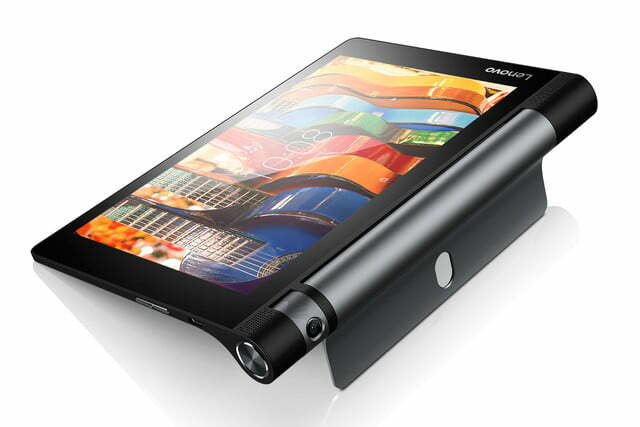 This allows Lenovo to fit some of the largest batteries we have ever seen on any tablet. 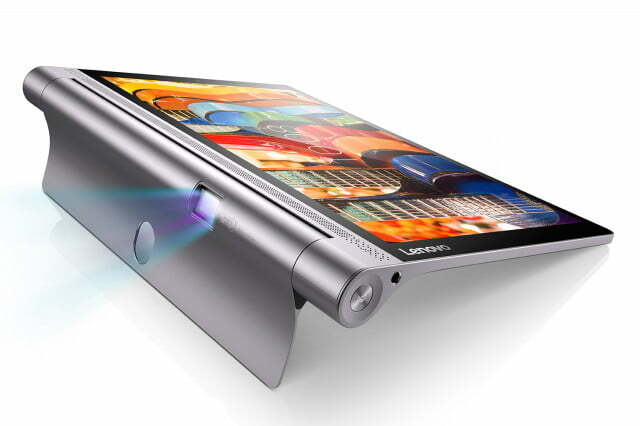 The Yoga Tab 3 Pro is made of premium aluminum and leather, but its claim to fame is the built-in 180-degree pico projector. This year’s model gets an upgrade over the Yoga Tablet 2 Pro as it can now project up to a 70-inch screen (50-inches previously) on any wall or ceiling at 50 nits. The resolution wasn’t specified, but we’re anticipating it will be the same as last year’s 854 x 480. The LCD IPS display measures 10.1-inches and has a resolution of Quad HD (2,560 x 1,600). The Yoga Tab 3 Pro is powered by a 2.24GHz quad-core Intel Atom x5-Z8500 processor and features 2GB of RAM. Internal storage options are 16 or 32GB, and an extra 128GB can be added through the MicroSD slot. The rear camera is 13-megapixels, while the front-facing lens comes in at 5-megapixels. Both feature Auto Focus. You’re going to need a massive battery to consume all that content you’ve been craving. The 10,200mAh battery will provide up to 18 hours of use, so you should have no trouble binge watching your favorite show or hosting a family movie night. Because the battery resides in the cylindrical base, the main part of the tablet is only 4.68mm thick. However, the extra large battery puts this tab on the heavy side. At 665 grams, it’s a lot heavier than the iPad Air 2, which is only 444 grams. Lenovo has sound connoisseurs covered as well. The front of the device has not one, not two, but four JBL speakers powered by Dolby Atmos 3D Surround Sound. Lastly, the IP21 rating is far from waterproof, but it does cover condensation. The Yoga Tab 3 Pro will be out in time for the holidays. The Wi-Fi version goes for $500, while the LTE version starts at $600. Lenovo is offering both 8-inch and 10-inch versions of the Yoga Tab again this year, but some of the specs have been toned down to make these tabs more affordable. Both versions of the Yoga Tab 3 feature LCD IPS displays with 1,280 x 800 resolution. This is down from 1080p (1920 x 1080) last year. Under the hood, there is a 1.3GHz quad-core Qualcomm Snapdragon (APQ8009), along with 1GB of RAM, 16GB of internal storage, and a MicroSD slot for up to an additional 128GB of storage. Last year’s tablets sported a 1.8GHz quad-core Intel Atom Z3745 along with 2GB of RAM. The 8 megapixel Auto Focus camera is a nice upgrade because it’s rotatable. It not only serves as the main camera, but a quick rotation means that you get the same 8-megapixels for selfies too. Lenovo knows that you will watch a lot of video on these tablets so they are equipped with two front-facing speakers powered by Dolby Atmos 3D Surround Sound. Those of you that like using a stylus for notes or drawing will love the included AnyPen technology. This means that you can use any metal object as a stylus. Other than the display size, the two tablets differ in the battery department for obvious reasons. The 10-inch version gets 8700mAh, while the 8-inch version gets 6,200mAh. However, both are rated at 20 hours of use, which is extraordinary. 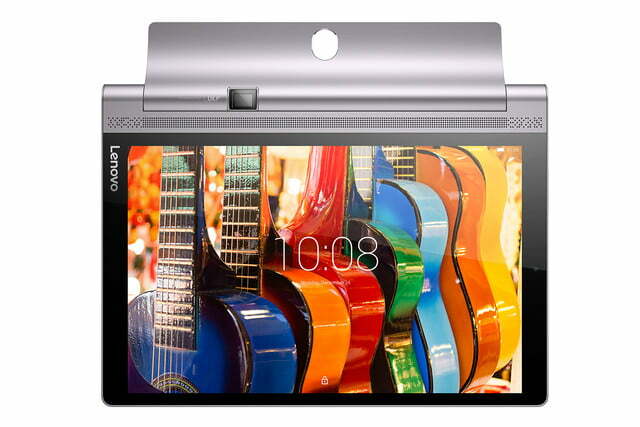 The Lenovo Yoga Tab 3 8-inch and 10-inch will be available in time for the holidays. The Wi-Fi versions will start at $169 for the 8-inch and $199 for the 10-inch. Lenovo will also offer LTE versions starting at $199 for the 8-inch and $249 for the 10-inch.